We know, of course, that such a sacrifice was insufficient because Hebrew 9 says that the blood of animals is insufficient to purify anyone from sin and that our purification from sin can come only from the blood of Christ who through the eternal Spirit offered Himself without blemish to God. The blood of animals could not atone for sins, but the sacrifice was still important because the sacrifice was an expression of faith, and as such it provided a temporary covering of their sins. It did not forgive their sins, but it provided a temporary covering. The full forgiveness would have to await the sacrifice of a perfect man — the Lamb of God. That's the reason that the Old Testament saints when they died did not go to Heaven. I don't know if you realize that or not, but when Old Testament saints before the cross died they did not go to Heaven. Instead, their spirits went to a temporary holding place called "Sheol" in the Old Testament or "Hades" in the New Testament. Hades, or in the Hebrew "Sheol," had two compartments. The one on the left — Paradise — was the holding place of the spirits of the just — the spirits of the saved. On the right was Torments, the holding place of the spirits of the unjust — the unsaved — and between them was an abyss that no one could cross. The saved could not go to Heaven and live in the presence of a holy God because their sins were only covered by their faith and they were not forgiven. They had to wait for the sacrifice of the perfect Lamb of God. When Jesus was sacrificed on the cross, we are told that His Spirit descended into Hades and we're told in 1 Peter 3 that He made a proclamation. It does not tell us what the proclamation was, but we can pretty well guess what it was — that the blood of the perfect Lamb of God has been shed. I can only imagine the roar of celebration that must have come from the saints who had been waiting all those years for that glorious news. Now their sins were not only covered, their sins were forgiven and they could finally go to Heaven. I think this is the meaning of a rather enigmatic passage that is found in Ephesians 4:8 which says, "When He, Jesus, ascended on high, He led captive a host of captives and He gave gifts to men." Jesus emptied Paradise from Hades and he took Paradise to Heaven. In other words, when Jesus ascended to Heaven, he took Paradise with Him. Now, ever since the cross, when a believer dies his spirit goes directly to Heaven. Everything was changed by the cross. Today, when a person puts his faith in Jesus Christ as Lord and Savior and is born again, when that person dies His spirit goes directly to Heaven and not to Hades. It's a different situation after the cross than before the cross because when we put our faith in Jesus Christ today our sins are not only forgiven, they are forgotten. They are not just covered, they are washed away. Praise God! And, therefore, when we die we go immediately to Heaven. The blood of Jesus God's son cleanses us from all sin. Further in Isaiah 53:10-11, he stated that the Messiah would be rendered as a guilt offering and as a result of the anguish of Jesus' soul, He would justify the many. In response to this prophecy, many, many years later, when Jesus appeared at the Jordan River to be baptized of John the Baptist, John cried out, "Behold the lamb of God who takes away the sins of the world." And, using the same imagery, the apostle Peter wrote, "We have not been redeemed with perishable things, like silver and gold, but with precious blood as of a lamb, unblemished and spotless, the blood of Christ." The apostle Paul summed it up best of all in 1 Corinthians 5:7 when he said, "For Christ, our Passover lamb, has been sacrificed." 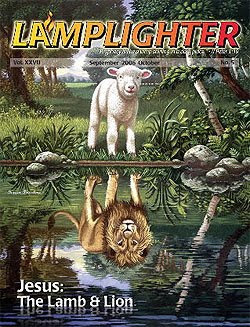 In the next installment of "Jesus the Lamb and Lion," we will look at Jesus as the Conquering Lion. I love that Jesus went to the Saint of the Old Testament and brought them to heaven with him. As for us going immediately, I know it to be true as when my mother was dying, Jesus let her see it and he walked with her and told her she could not come until He called her by name. The experience was going on a couple of days while she was bedridden, not eating or drinking and hospice said it was hours until she was gone. Then she woke up, asked for drinks and food and when we asked where she had been she said Heaven of course! I sat and wrote everything she said and described... what a treasure. After telling us that Jesus said to tell us He is coming soon, Jesus called her by name 2 weeks later. Heaven is very real!